First prep the asparagus, bring a large pot of salted water to a boil. Add the asparagus and cook for 3-5 minutes; until al dente. 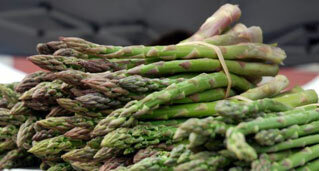 In a bowl, toss the asparagus with the vinaigrette. Season with salt and pepper and let stand for about 1 hr before serving. Prepare the potatoes by placing in a sauce pan filled with cool water and add 3 tablespoons of each mint and salt. Bring to a boil and simmer for 15-20 minutes, until done. Drain and let cool. Mix together the sun-dried tomatoes, garlic and chives. To assemble, lightly cover each plate with Springtime greens, such as spinach or pea tops. Mound the potato salad on top of greens, arrange the asparagus on top and garnish with 4 tablespoons of mint.